The film is set in post-World War II Moscow. Lieutenant Vladimir Sharapov (Vladimir Konkin) is a young reconnaissance officer and a decorated war veteran who has just returned from the war and is assigned to peacetime service with the famous MUR (Moscow Department of Criminal Investigations). 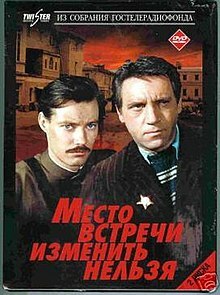 There he becomes part of an elite detective team led by the brilliant, tough, no-nonsense Captain Gleb Zheglov (Vladimir Vysotsky). The duo becomes embroiled in two seemingly unrelated investigations: that of the murder of young aspiring actress Larisa Gruzdeva, and the hunt for a brazen, vicious gang of armed robbers that calls itself "The Black Cat" and constantly manages to evade capture. While suspicion in Gruzdeva's murder initially falls on her estranged husband Dr. Gruzdev (Yursky), it gradually becomes obvious that the two cases are connected, as a Black Cat mobster known as Fox (Aleksandr Belyavsky) is implicated in the murder. As a result of Zheglov's successful high-stakes operation to capture Fox, Sharapov inadvertently finds himself undercover at the Black Cat hideout, sparring with the gang's menacing leader, the Hunchback (Armen Dzhigarkhanyan). What ensues is arguably one of Soviet television's most memorable and suspenseful finales. Much of the series revolves around the relationship between Zheglov and Sharapov. While the two become close friends and roommates, they are essentially opposites who often clash throughout the film. At the root of the conflict lies idealistic Sharapov's disagreement with Zheglov's "ends justify the means" approach to law enforcement. Zheglov, hardened and cynical from spending the war years in the rear fighting organized crime thinks that "a thief's place is in prison, and the public couldn't care less about how I put him in there". To that end, Zheglov thinks nothing of using dubious tactics such as planting evidence to justify the arrest of a notorious pickpocket. Sharapov, on the other hand, considers that law is a higher value for its own sake and cannot be used merely as a tool. A tense conflict also arises when, in order to mislead Fox, Zheglov elects to continue keeping Gruzdev under arrest even after it becomes clear that the man is innocent. Yekaterina Gradova — Woman with "Ruchechnik"
The film's title is a reference to the finale, where Sharapov's botched attempt to withdraw after making contact with the gang forces Zheglov to follow a previously discarded plan for a risky undercover operation. Hoping that Sharapov will lure the bandits to the scene of a prior robbery as they have previously rehearsed, Zheglov utters: "The place and time of the operation cannot be changed." According to some recollections, Vysotsky played a major creative role in the making of the series. He conceived the idea of turning the novel into a movie after receiving an advance copy of the book from the Vayner brothers, and he actively campaigned for the part of Zheglov despite the fact that the character in the novel was a much younger man. During the making of the film, Vysotsky frequently substituted for Govorukhin as director, including directing the entire scene of Dr. Gruzdev's interrogation, and he also invented the comical attributes of the character of Kostya "The Brick" Saprykin (a good-natured pickpocket with a speech impediment). Young actor Ivan Bortnik (a close friend of Vysotsky) was praised for his vivid and accurate portrayal of the Black Cat henchman Promokashka—the role that dominated his further film acting career. Often typecast as a stereotypical Russian criminal, Bortnik is actually a highly educated man hailing from a family of Moscow academics. He created his iconic part (most of it ad-libbed since the creators had only envisioned a minor supporting role with little dialogue) only by recollecting his occasional street contacts with young criminal wannabes. Similarly, veteran film and voice-over actor Aleksandr Belyavsky would routinely get approached in the street by ex-convicts who expressed admiration for what they thought to be the actor's former criminal background, citing the scene of Fox's interrogation where he is bleeding from his lip and arrogantly wipes the blood on the side of Sharapov's desk. In reality, Belyavsky had no criminal background whatsoever, and he improvised the entire scene by using cherry preserves he had borrowed from production assistants during a lunch break to simulate the blood. One of the film's best known comical scenes originated from an acting gaffe. While signing a written affidavit, prostitute Manka "Obligatsiya" asks Zheglov whether her nickname (Russian for government bond) is properly spelled with an "O" or an "A". Zheglov responds absentmindedly with the correct spelling, before realizing what she was asking and directing her to sign her real name instead. Actress Larisa Udovichenko has revealed that the entire moment was unscripted and she actually asked about the spelling because she had been unsure, with Vysotsky deciding to play along. Director Stanislav Govorukhin liked the impromptu and included it in the film. Sharapov's love interest patrolwoman Varya Sinichkina dies at the end of the novel. The ending was altered in the movie because the studio administrator thought it was too depressing. The Vayner brothers later admitted that they liked the new happy ending better. The series was originally intended to have 7 parts, but the Soviet broadcast authorities ordered to trim them down to 5. As a result, many scenes were left out of the final cut, with creators struggling to maintain the flow of the narrative. The film's massive popularity made it a major source for the Soviet and post-Soviet culture. Armen Dzhigarkhanyan lampooned his own performance as The Hunchback in a 1998 installment of a popular Armenian sketch comedy series Our Backyard. In 2010, Russian Prime Minister Vladimir Putin used Zheglov's famous "a thief's place is in prison" line in widely criticized remarks against the jailed tycoon Mikhail Khodorkovsky. A sculpture featuring Vysotsky and Konkin (as Zheglov and Sharapov) is installed outside the Internal Affairs Ministry building in Kiev, Ukraine. In 1998, Russian TV star Leonid Parfyonov made a commemorative documentary Meeting Place, 20 Years Later, putting the history of the series' creation in the wider social context of both the plot and the production eras. Parfyonov interviewed members and acquaintances of the cast and crew as well as actual police detectives and criminals of the 1970s. ^ Место встречи изменить нельзя,, - Город.томск.ру (in Russian). Gorod.tomsk.ru. 2010-03-22. Retrieved 2012-09-08. ^ "NEWSru.co.il". NEWSru.co.il. Retrieved 2012-09-08. ^ "Mer Bake - Mer Bake 2". Armeniantube.net. Archived from the original on 2012-03-13. Retrieved 2012-09-08. ^ Cassandra The World in 2012 (2010-12-28). "The Khodorkovsky trial underlines Putin's power in 2011: "A thief should sit in jail..."". The Economist. Retrieved 2012-09-08.